If selected, this option causes Folder Guard to display the Unlock button when a user navigates to a password-protected folder with Windows Explorer. If you don't want other users of your computer to see such a button, clear this option. In such a case, you may want to enable the option to add the Lock/Unlock commands to Windows shortcut menu (described below) in order to be able to unlock the protected folders by right-clicking on them and entering their passwords. If selected, this option causes Folder Guard to add the Lock and Unlock commands to the Windows shortcut menu for the folders protected with passwords. Note that if you enable the stealth mode, the Unlock command may not be shown on the shortcut menu even if you select this option. Check this box if you want the protection to resume automatically after the computer screen is locked (by a screensaver program, or by pressing the Win+L keys), or when a user logs off Windows. If the protection is already in effect while the screen is being locked, this option has no effect. Note that in the latter case, it would NOT lock the password-protected folders that you had previously unlocked, if any. If you want a password-protected folder to be automatically locked when the screen is locked, select the appropriate option on the Password properties screen for the password. If selected, this option causes Folder Guard to clear the history of the recently used documents and programs, displayed by Windows Explorer, every time you resume the protection. You may want to select this option if you don't want other users to be able to see the traces of your private documents in Windows Explorer. Note that this option clears all history, not only the entries related to the protected files and folders. Also, this option does NOT clear the history of other applications you might have, it only affects the history of Windows Explorer. If checked, this option makes Folder Guard protect the folders even in the safe mode of Windows. Note: This option must be used with care. The "hot key" is a combination of keys that, when pressed together, would display the prompt to pause or resume the protection of Folder Guard. 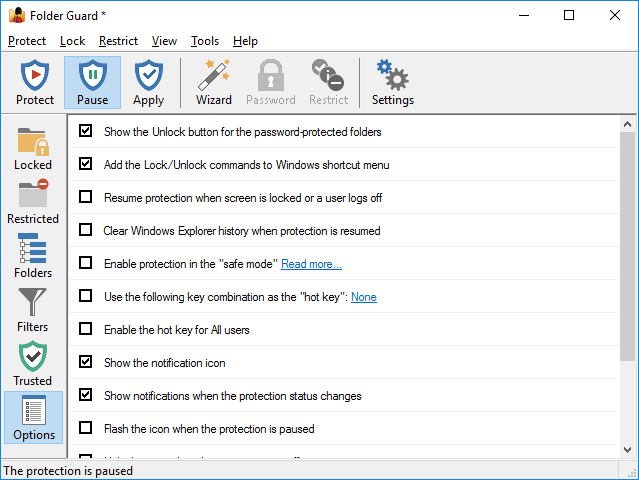 Or, if a Windows Explorer window is active on the screen displaying a password-protected folder, then pressing the hot key would dislay a prompt to unlock the password-protected folder rather than the prompt to pause or resume the protection. If selected, this option causes Folder Guard to use the keyboard combination you have entered in the box below it as the "hot key". Note that the hot key combination is not functioning while the Folder Guard application is open. However, the hot key should start working as soon as you close the Folder Guard application. If selected, this option causes Folder Guard to display its notification icon. If selected, this option causes Folder Guard to display the popup "balloons" or the "fly-by" notifications every time the protection is paused or resumed, or when a password-protected folder is locked or unlocked. Clear this option if you don't want to see such notifications. If selected, this option causes Folder Guard to periodically flash the image of its notification icon to indicate that the computer is currently unprotected. If selected, this option causes Folder Guard to hide the notification icon when the protection is in effect. You may want to select this option if you don't want other users to see the icon while they use your computer. This option affects how long Folder Guard "remembers" users who unlock the password-protected folders. If a user unlocks such a folder, and then does not access that folder for the specified period of time, the folder would lock itself automatically and the user would need to re-enter the folder password again to unlock it. You may find this option useful, for example, if you have a large number of users who unlock a password-protected shared folder on a server via a network. If the number of such users is very large, you may want to reduce this timeout value, to reduce the amount of the server RAM used for keeping track of such users.